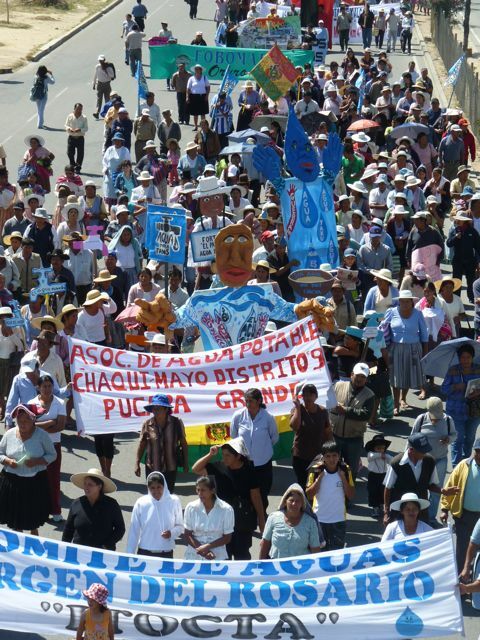 Many here in Cochabamba are celebrating the tenth anniversary of the Water War, a series of protests against the newly-privatized water utility and its French and American owners in 2000. Back then, privatization was taken on faith as an all-purpose solution by Bolivia’s national government. Rate payers, who saw 40 to 200% hikes in their bills, and water supply committees that coordinate local water systems (which the new corporation claimed as its own) disagreed, strongly. Sectoral protests found a new form, a cross-movement coordinadora that brought them together, and caught fire. Two major confrontations in February and then April 2000 saw protesters take over the central streets of Bolivia’s third largest city. In Bolivia, the Water War came towards the beginning of a series of massive mobilizations that redefined politics. It was the first globally visible reversal of neoliberal policies imposed by the IMF and World Bank (the package of such policies, including privatization and “fast money” or easily reversible foreign investment, was called the Washington Consensus). So, on Wednesday a march was held to celebrate the anniversary and to inaugurate a three-day conference on water rights activism globally. At the Factory Worker’s Union complex, speakers from four continents talked about the inspiration that the water war provided for their movements, doing such things as mobilizing against the privatization of municipal water systems in Italy, advancing a national referendum on public water in Uruguay, and protecting irreplaceable (in human lifetimes) aquifers from bottled water manufacturers in Maine. More photos from Wednesday are on flickr here.